Attachment for High Reach Truck - Reach trucks are loading machines used by types of organizations that sustain a warehouse facility or distribution center concerning the arrangement of completed commodities and materials on pallets which are inserted into elevated shelving units. This mechanism provides easy and secure retrieval of the loaded pallets whilst ensuring well-organized storage of merchandise that are not required immediately. The basic reach truck uses an out rigging system mounted to the front of the vehicle. A set of telescoping forks that travel up and down are mounted to the out rigging. A hydraulic setup which lets the operator to pick up and reposition the load over the outriggers is also included in the forks. This design offers a more even balance of the weight and will allow for easier maneuvering among the storage shelves and small aisles. After arriving at the specific shelves designed for the pallet, the hydraulics permit the forks to swing and slide the pallet into place. A reach truck will usually fit into an aisle less than 10 feet across without any issue so long as there are no obstacles protruding from the shelving. 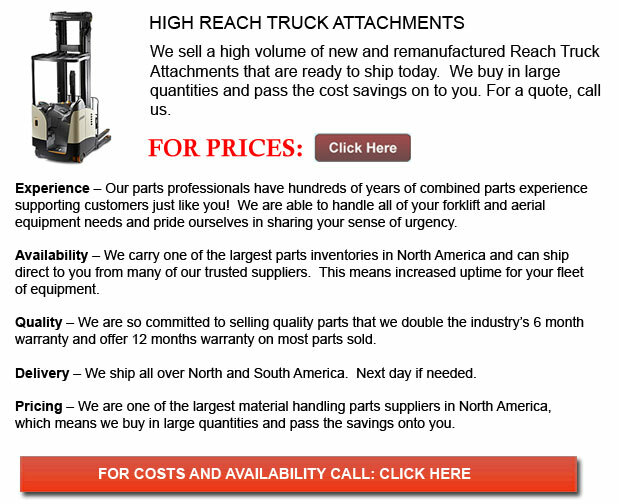 Several models of the reach truck are accessible. The most simple unit is the stand-up reach model which will slide forks underneath the pallet and transfer it to a storage location then slide it into place. This type of reach truck is ideal for shelving units that are no deeper than one pallet of goods. A double-reach vehicle works in the same fundamental manner as the stand-up type however uses telescopic forks that are lengthy enough to slide a pallet into shelves that accommodate two pallets. Straddle reaches are a different reach truck variation. This style of reach truck slides under the pallet and is additionally able to grab the sides as well. The straddle reach unit is useful when grasping the sides of the pallet and commodities will not result in breakage. They allow simple pallet retrieval of a pallet that may be 4th or 5th in line and are useful when the shelving units are within reach in more than one direction. Production plants, warehouses and even textile businesses normally utilize one or more styles of reach truck. They may be used to stock pallets of finished merchandise, storing provisions, materials, equipment, and to maintain the up keep of storage units is common practice. Reach trucks are incredibly straightforward equipment to control to help make good use of your time and accessible stockroom space.